It appears to delete ALL files in User Downloads without visible warning or option to change it! This is nasty behaviour (I store much stuff on Public Downloads but fortunately only the User Folder appears to be touched)! Indeed which option controls this as I cannot for the life of me find it!? I would like to know about and use this as I do not wish to go back to the spamware and virus ridden CCleaner! My Bad! 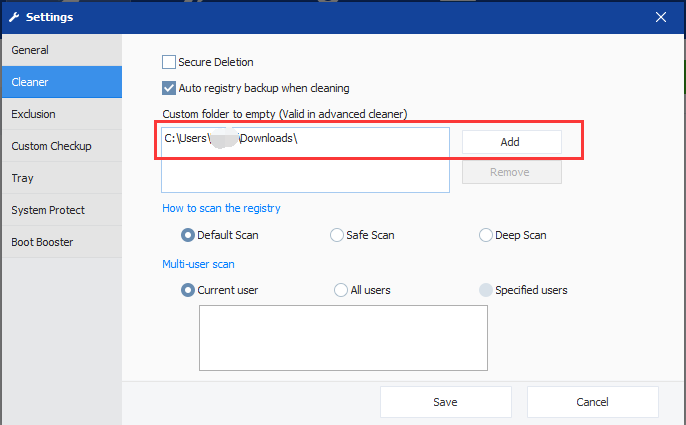 : Its an option in Windows Disk Cleanup so do not check the "Downloads" option there. I don't remember this so it probably came with a Windows Update. Also be careful with Windows new Storage Sense which will do the same thing if you do not scrutinise its options carefully also. I have taken two liberties of: Putting my (backed up) stuff into another C:\Downloads Folder (since I use Portable Apps off of C:\ also); Lastly the links between these folders (Desktop, Downloads, Public Downloads) which I wish to keep I have made read-only so they shouldn't get deleted by accident either. Current Wise Disk Cleaner and Wise Care 365 won't clean Downloads folder. If someone want to do it, he can Add Downloads folder in Settings, then Advanced Cleaner can empty it.